In Honor of Mini-AG, a GIANT cupcake! When I was preggertons, I used to pick up LOVE Bakery cupcakes (yes, sometimes more than one) and eat them bed. SO, I thought it was only fitting to get Mini AG’s first birthday cake there. I was so sad to learn that even though I went in two and a half weeks early, that they were fully booked to do Mini’s cake. Hummingbird, definitely saved the day! 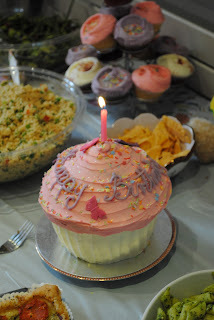 I got this lovely cupcake-cake for the party, along with a ton of pink and purple cupcakes (and red velvet of course!) They were totally scrumptious and a big hit! Horray! Happy Birthday Mini-AG! Mommy loves you! OH, and speaking of cakes, I forgot to post this from a couple months back… check out the amazing birthday cake Hubbity had made for me from the Chelsea Cake Shop. Too cute, right? Cute! Hummingbird will also to mini cupcakes to order. Very cute for birthday parties.